Berlin is wonderful in all seasons—in the spring when the Tiergarten begins to bloom, in the summer when the beach bars are in full swing, and in the fall when Oktoberfest celebrations make their way north. But what about winter? Bundle up and visit between mid-November and New Year’s Eve for maximum Christmas market festivities! While Nuremberg and other Bavarian towns have the traditional markets covered, Berlin’s markets boast a unique city flavor. True to its name, the WeihnachtsZauber (Christmas Magic) Gendarmenmarkt transforms the Gendarmenmarkt into a magical plaza. Flanked by the impressive German and French cathedrals, this is one of the city’s more upscale markets. It features sit-down restaurants with waitstaff as well as a full roster of musicians in addition to the standard Glühwein (mulled wine), snack, and gift stands. Glühwein selection is particularly good throughout the market, with endless options for warmth-inducing customizations. This is one of the few markets with an entrance charge, but at a mere €1, it’s worth it. WeihnachtsZauber generally runs from Thanksgiving through New Year’s Eve, but be sure to check the annual schedule for specifics. 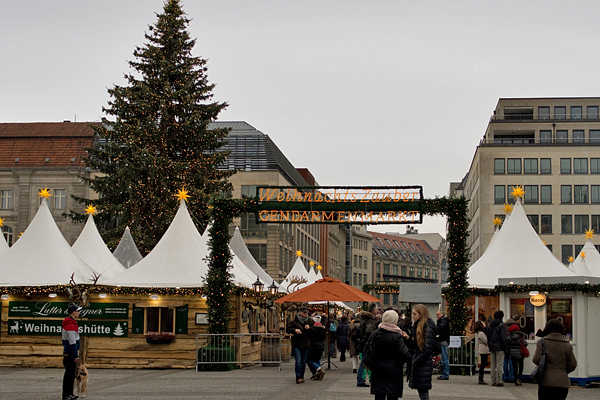 The Berliner Weihnachtsmarkt (City Christmas Market), on Berlin’s west side, serves as the city’s quintessential market. It has all of the traditional aspects covered, with its giant German Christmas pyramid and hand-carved crafts, as well as the modern conveniences, including carnival rides and fried food. Smack in the middle of Kurfürstendamm’s bustling shopping district, it’s the ideal spot to take in the holiday’s twinkling lights and merriment. 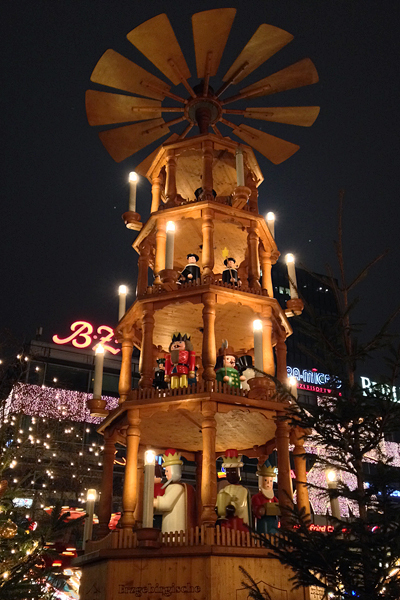 Winterwelt (Winter World) at Potsdamer Platz is perhaps Berlin’s most energetic and commercial market. Featuring a massive artificial tobogganing hill for revelers of all sizes and extending into the nearby light- and electronics-filled Sony Center, Winterwelt is a site not to be missed. It generally closes shop right after Christmas, so visit early and often. 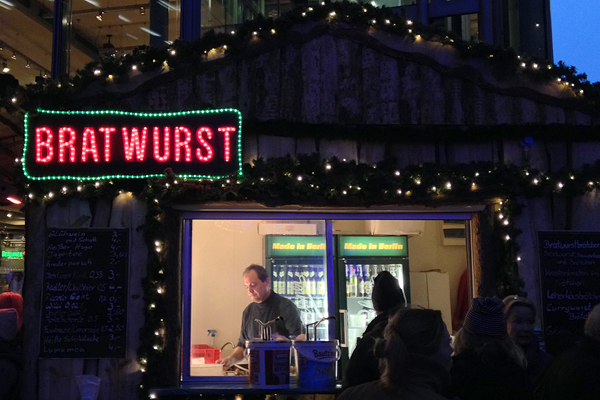 Like most of Berlin’s Christmas markets, Glühwein is plentiful, but aside from Wurst, gluten-free food options are in short supply. Snack beforehand, partake in some warming beverages, and enjoy the festivities! Other slightly out of the way markets are also well worth it if you have the time, especially the beautiful Christmas Market at the Charlottenburg Palace, the more traditional Spandau Christmas Market, and the Scandinavian market at the Kulturbrauerei. 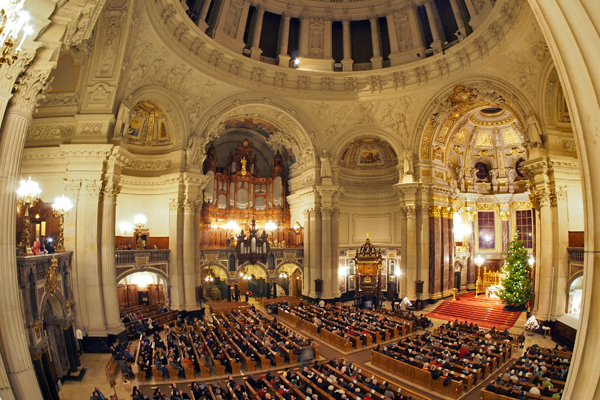 If you happen to be in Berlin on the holiday itself, be sure to visit the Berliner Dom to warm up and soak in the Christmas spirit.